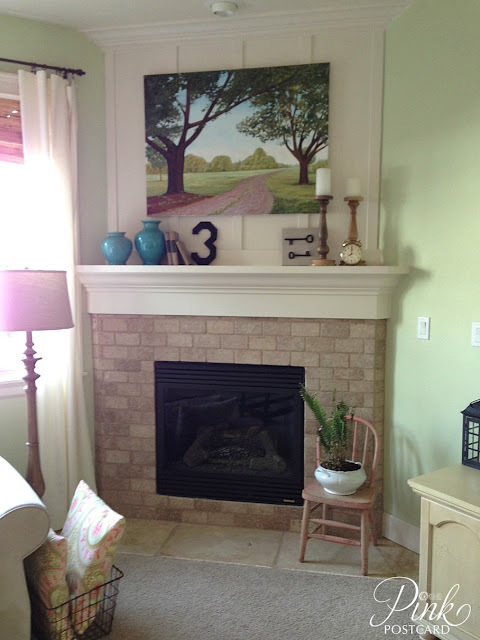 Sometimes I look at other bloggers home photos and everything looks so effortless. For me, it is work, girl! If it weren't for the inspiration from some of those bloggers, and scads of magazines and decor books, I would probably have a pretty boring place. It's been great to work through some of those intimidating areas and grow to love the spaces our family lives in and sees every day. My mantel is one of those spots. I've been playing around with it recently, and so far I'm liking it. I am not one of those people who decorates and redecorates my mantel. I may occasionally add in some seasonal flowers, and during the fall and holiday months it will get some festive looks, but I pretty much just leave it alone for most of the year. 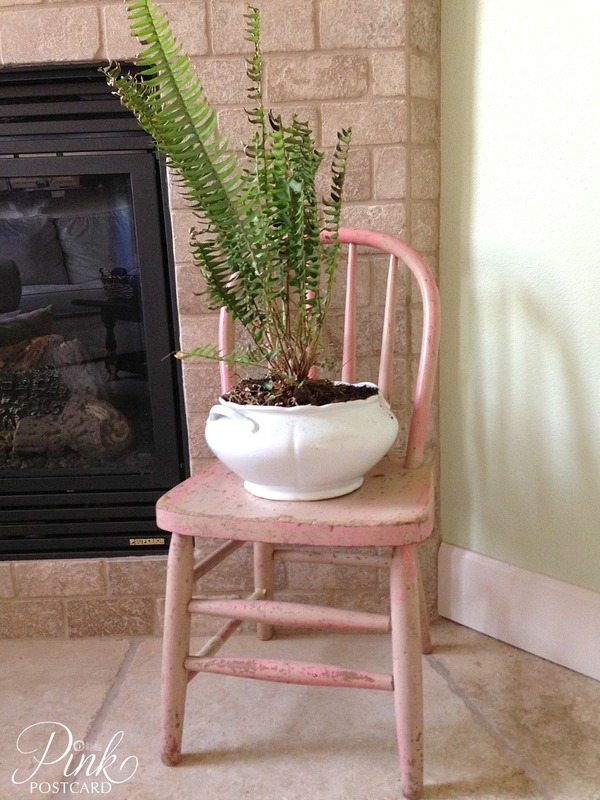 I have had my eye on the darling little pink chair for awhile now. 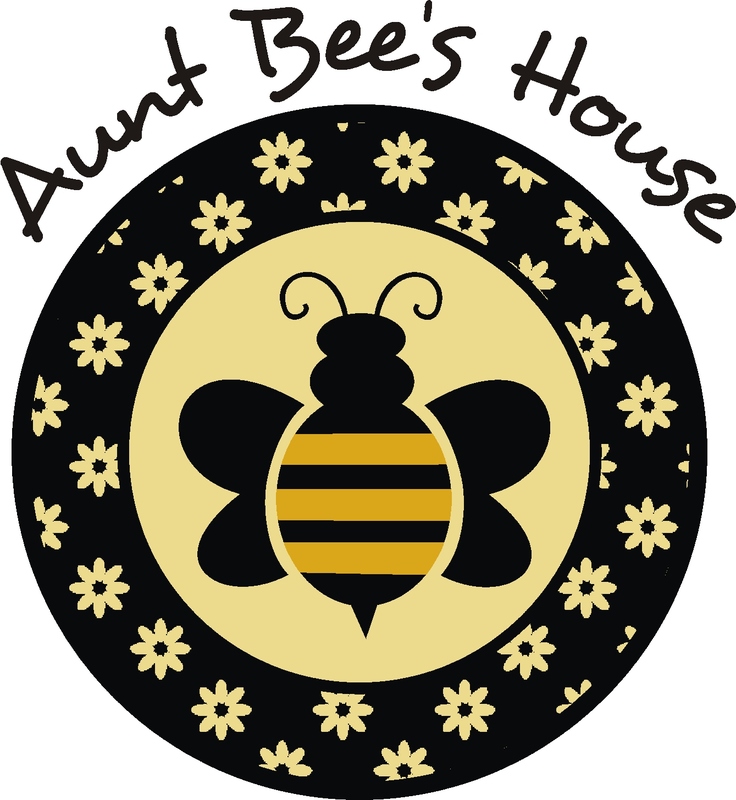 I finally found a place I could use it, and bought it from another vendor at Aunt Bee's House. I love working at a place that I have always enjoyed shopping at - and still do! The wood candlesticks were something I got at TJ Maxx last year. The alarm clock was something I spotted at one of my favorite treasure spots. I had planned to sell it, but decided I liked it too much to part with it. 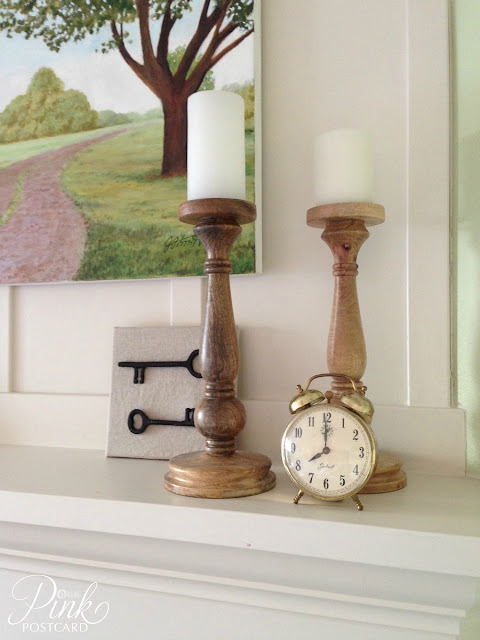 The keys are not vintage- I just hot glued them to a paint canvas covered in natural fabric. I've had it for awhile in different spots in the family room. I like the graphic element they add. 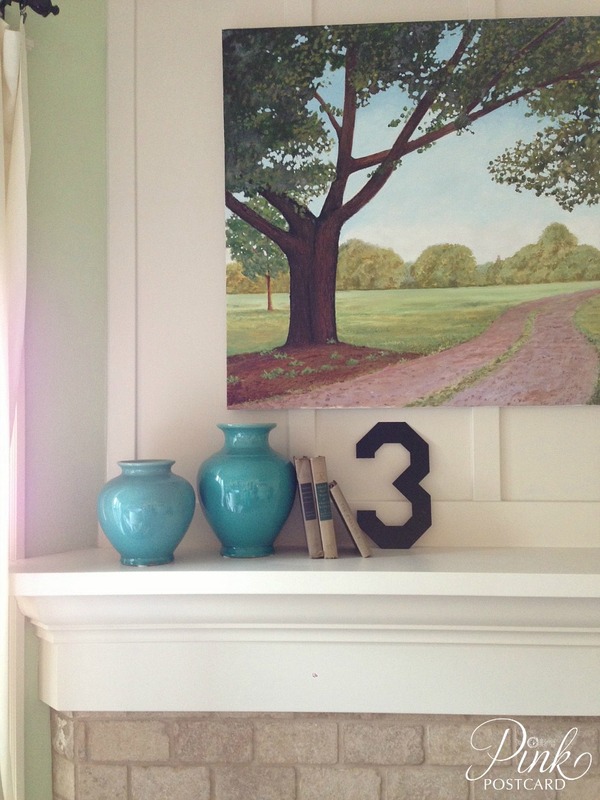 The aqua vases are one of the original elements I've kept up here. I like how it compliments the blue in the painting. I think I got those at Target about 5 years ago? The books were a Goodwill purchase. The number 3 is a new item. I got that from Molly Mo's at a recent sale. Being a family of 3, I always like to have 3's around the house. It used to bother me that I wasn't able to have any more children; now we celebrate our small family! Do you recognize it? I've admired this at Target for a few months. I spotted it at Goodwill a couple weeks ago! For $30 less than retail!!! Our Target stores will frequently donate their stuff to our Goodwill's. (and there's nothing wrong with it other than a few minor dents in the shade. Here's to enjoying our new eclectic mantel! P.S. I always get inquiries on the painting above our mantel. I commissioned my dad to paint it from a photo I tore out of a magazine several years ago. He's a gifted artist and creative inspiration to me! I love having something so special made by him. It also reminds me of one of my favorite local parks / nature preserves. love the painting and love that it is special! and that sweet pink chair- perfect! 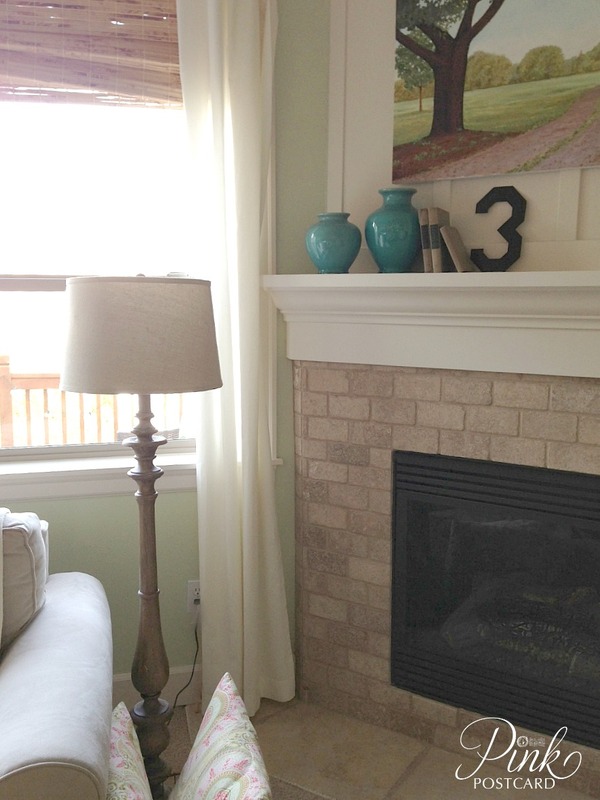 Love that darling little pink chair and what a deal you got on that floor lamp (our GW's get Target stuff too). Hope you have a wonderful weekend.